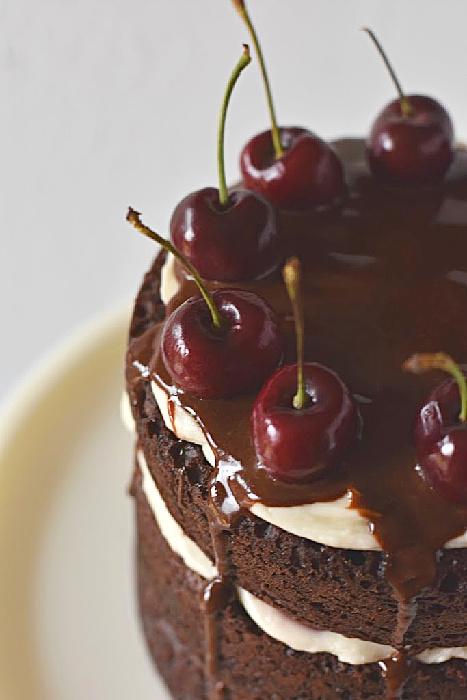 My father has a weakness for Black Forest Cake and this recipe is a winner. There’s nothing better than serving up a dessert when you get to see someone’s eyes light up in anticipation of tasting it. 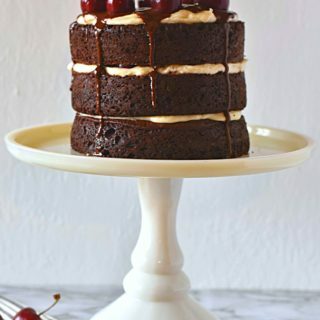 This Black Forest Cake recipe isn’t super difficult. Take your time and you’ll hit it out of the park with this baby. Take a look at it…it’s impressive right? 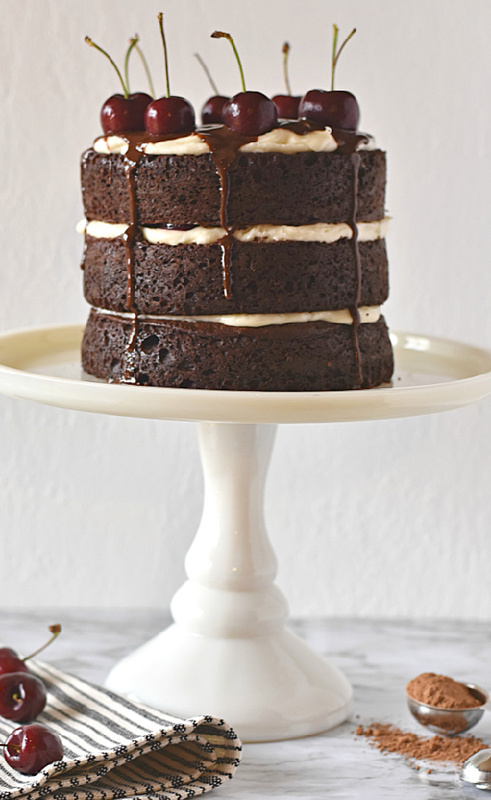 The three layers with the visible frosting and the chocolate drips just SCREAM delicious to me. 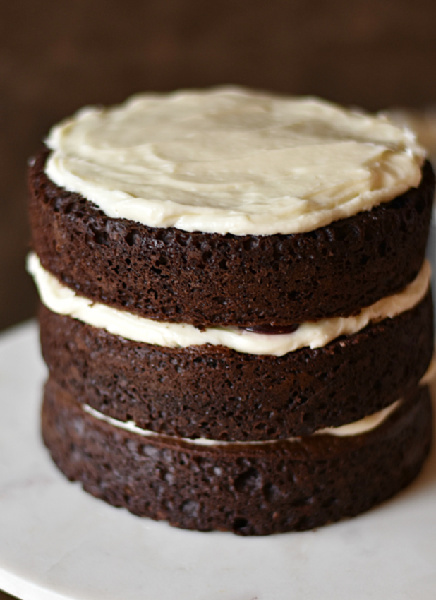 Listen, I’m not a professional baker and if I can nail this Black Forest Cake recipe…you can too. 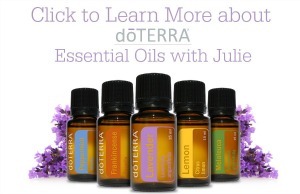 If you’re giving it a go, take your time! Make sure you allow the cake layers to completely cool down before frosting and stacking. 1/4 cup cherry vodka or similar liquor. Prepare your cherries by combining the liquor, sugar, and cherries into a small sauce pan and heat until boiling. Let simmer for about 10 minutes and then remove from heat. Let the cherries cool before adding to the cake. Combine all dry ingredients into a large mixing bowl and mix with a whisk to break up any lumps. Add in all wet ingredients except the hot water and mix well until combined. Add in the hot water slowly and mix in. The batter will look a little runny. Prepare 2 8” cake pans with nonstick spray and distribute the batter evenly. Bake for 25-30 minutes or until a toothpick inserted in the middle of the cake comes out clean. Let cool for about 10-15 minutes in the pan and then transfer to a cooling rack to cool completely….don’t rush this one, allow complete cooling friends. Cream together the cream cheese and butter in the bowl of a stand mixer. Mix for about 5 minutes to make sure there are no lumps remaining. Add in vanilla. Mix in the powdered sugar one cup at a time and combine after each addition. After all ingredients are incorporated, mix for another 3-4 minutes until light and fluffy. Place one layer of cake on a cake board or plate. Place 1-2 tbsp of syrup on the cake and use a brush to distribute add about 1/3 of the cream cheese frosting and place the sliced cherries on top and push into the frosting. Add another layer of cake and continue. After you add the remaining frosting to the top, melt the chocolate and cream together and melt in a microwave safe bowl for 30 second increments until melted. Allow to cool for about 5 minutes and then add on top of the cake and allow to drip on the sides. Add fresh cherries to the top and enjoy! ¼ cup cherry vodka or similar liquor. Let cool for about 10-15 minutes in the pan and then transfer to a cooling rack to cool completely. Place one layer of cake on a cake board or plate. 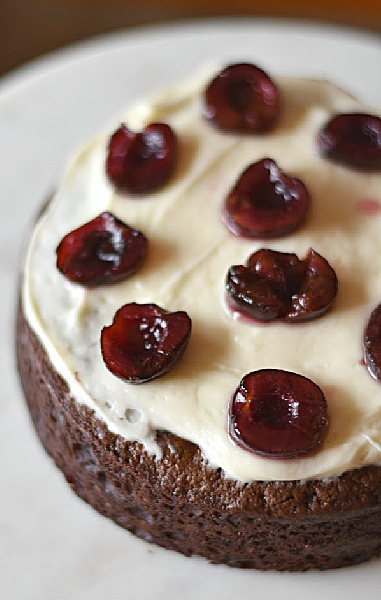 Place 1-2 tbsp of syrup on the cake and use a brush to distribute add about ⅓ of the cream cheese frosting and place the sliced cherries on top and push into the frosting. Add another layer of cake and continue.